We're currently in the middle of the 'GLOBAL plaza' at the BELIEF symposium in Brazil. Consisting of remote presentations from 4 continents it's a great opportunity to find out about the different e-infrastructure and grid projects going on across the world. The software that makes this all possible is Isabel created by the GLOBAL project. 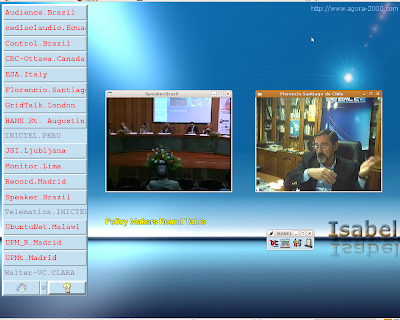 Combining videos from the remote sites with what's going on at the symposium in Brazil as well as application sharing software which enables viewers to see slides from any of the connected sites, it's really helping the grid and e-infrastructure community to interact and communicate as much as possible. Isabel is easy to set up, does not require huge technical expertise and the team are always happy to help if you have any problems. I'd highly suggest using Isabel the next time you can't make it all the way to Brazil, or any other conference for that matter!